Calacatta nano crystallized stone-welcome to china marmoglass, nanoglass, nano crystallized glass panel crystallized glass panel,crystallized white stone,white marble,minicrystal stone. A wide variety of good calacatta gold Nanoglass options are available to you, such as big slab, cut-to-size, and tile. China Maroglass Co.,Limited is the origin manufacturer and exporter for Calacatta Gold Nanoglass in south of China. 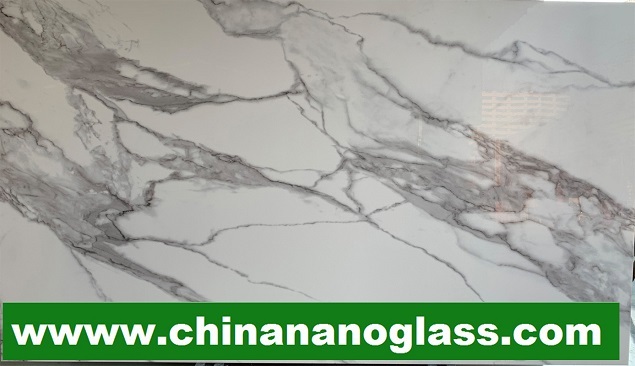 We can make Calacatta Gold Nanoglass for Countertops, mosaic, exterior - interior wall and floor applications, fountains, pool and wall capping, stairs, window sills and other design projects. Calacatta Gold Nanoglass by xiamentang is a kind of Crystallized Glass Panel. It also called Calacatta Gold Vein Nanoglass ,Xiamentang Nanoglass, Calacatta Golden Nanoglass ,Calcutta Gold Nanoglass,Calacata Gold Nanoglass ,Calacatta Doro Nanoglass,Calacatta Golden White Nanoglass ect.